The current Eureka City Council. 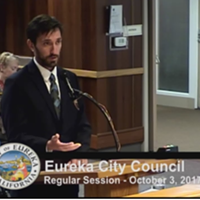 On Tuesday, the Eureka City Council will tackle several topics that could have long-lasting impacts on the city. First, the ward redistricting ad hoc committee, which has been meeting for two months to discuss where the lines for the city's five wards should fall, will present its findings. With two current city councilmembers (Natalie Arroyo and Kim Bergel, wards 5 and 3 respectively) up for re-election, and another terming out (Marian Brady, Ward 1) in 2018, the district boundaries for these three wards could tip the balance of future council decisions, especially now that the city has switched to a true ward voting system. The city will also hold a public hearing on the potential annexation of four parcels currently held by California Redwood Co. The company, a subsidiary of Green Diamond Resource Co., itself a spin-off of the Simpson Timber Co., stopped processing redwood in 2014 and shut down its operations in Humboldt County in 2015. The currently unincorporated land, where the company once had its corporate offices, has been sitting vacant ever since. Boundary maps show a little bump of blue land next to U.S. Highway 101, facing the bay, surrounded by red, city-zoned land. Should the city annex the property, it would provide city services such as water, power and law enforcement. According to Rob Holmlund, director of community development for the city, the reason the land wasn't incorporated into the city to begin with is an "old and complicated story that goes back to the 1950s." "In simple terms," Holmlund told the Journal in an email, "the original property owner did not want to be annexed into the city at the time when all of the surrounding properties were being annexed. So, the city boundary went around the site." See related PDF The proposed annexation. So, should the 101 acres of land, which falls into the heavily-regulated Coastal Zone, be annexed into the city, what could possibly done with it? Holmlund says there is no specific plan at this time, although his department will be exploring future zoning requirements and "potential future utility demands." "We are currently analyzing a range of potential development futures for the site, including mini industrial park, large industrial park, automall, outdoor recreation (such as minigolf or go-carts), RV park, and scenarios that have combinations of those elements," Holmlund wrote. "Be aware that a wide range of uses fit into the 'industrial' category, such as niche manufacturing, food manufacturing, general manufacturing, breweries, and dozens of other similar uses. We are also exploring potential options for the bay trail and mitigation specifically associated with development of the site. It is critical for me to point out that the city's exploration of all of these potential uses is only based on the fact that we need to identify a zoning designation, development standards for the site, and potential utility demands. It is possible that some of these options are not viable." It's also possible, according to Holmlund, that the current or future property owners might not be interested in any of these possibilities, so the city is only currently looking into what might be allowed on the site. The California Coastal Commission will also be the primary permitting agency for Coastal Development Permits at what is being called the Brainard Annexation, adding another layer of restriction. Staff is also recommending several changes to the section of the city's municipal code having to do with its cannabis policies. With the deadline to develop customized adult use of recreational marijuana policies before state regulations come into play in January of 2018, the city's development services department has made several recommendations for cultivation within city limits. Most notably, all outdoor commercial cultivation will be banned, and the maximum space allowed for processing will be expanded from 20 square feet to 50. Most other policies having to do with commercial cannabis production will align with current medical cannabis guidelines. Staff is also recommending a new "microbusiness" license category allowing licensees to conduct cannabis activities as regulated by the size allowed in its associated zone. If you were hoping for a pop-up edibles event, you might be out of luck. Staff is also contracting with an independent track and trace provider in anticipation that the state's own program will not be up and running in 2018. This may add to the tangle of regulations and agencies cannabis entrepreneurs find themselves struggling with, as staff recommends applicants "participate in both programs, until the state provider is proven sufficient." Finally, a proposed change to the city's municipal code may make it easier for city officials to declare buildings a "public nuisance," one of the circumstances under which it can condemn a building and take legal action against its owner(s), which it has done several times over the last year with Floyd and Betty Squires. Currently, the municipal code allows this action for buildings which lack hot or cold running water, light, ventilation or sanitation, among other conditions that might pose a danger to human life and health. The amendment would add a provision currently in the state health and safety code regarding "visible mold growth," excluding that which would be found on surfaces that normally accumulate moisture, such as bathrooms. 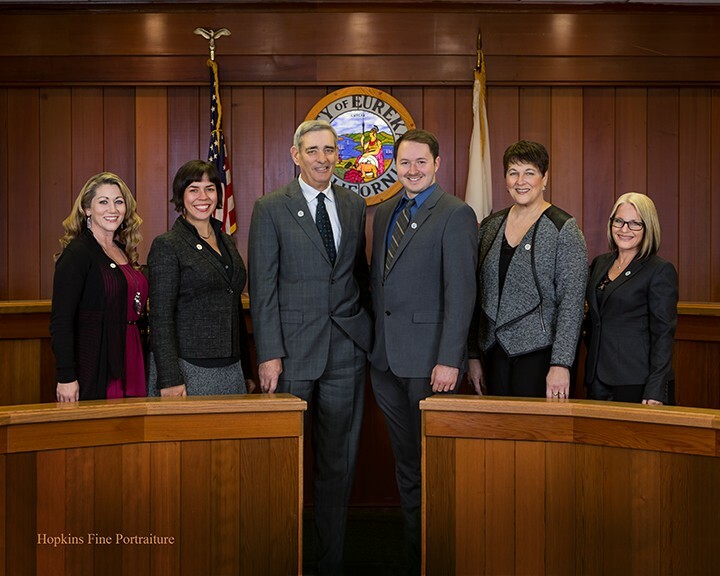 A full agenda for the city council meeting, which will be held at 6 p.m. on Oct. 3, can be found here. Editor's Note: This blog was updated to include the correct date for the city council meeting, which is Oct. 3, not Oct. 4. The Journal regrets the error.